Th bus leaves Issaquah High School at 8:30am sharp! Don’t be late. Estimated time of return to school is 4pm. Top 3 individuals per event will be awarded, as well as Team trophies to the top two men’s and women’s teams. Concessions will be available for purchase. Many meet records were set this past weekend, and although Issaquah didn’t capture one (although the girls 4×200 did break the past meet record along with Union and Tahoma) , the team had some individuals PR’s, as well as School Records. Fantastic job to both teams! Thank you to the alternates, friends and families that came out and supported the team. Please make sure to wash and turn in your uniforms Tuesday. Congratulations to the boys and girls that qualified to the penultimate event of their high school careers. It is a significant accomplishment since qualifying meant that they had to be finish in the top two in the finals of the district meet or achieve a qualifying standard for their event. Friday: Athletes will be excused from school for the day. Bus leaves from the high school at 7:45 AM. Saturday: The bus leaves from the high school at 7:45 AM. Athletes will be provided meal stipend, but if they feel they will need more they should bring some. Food sources are sort of limited at the meet with concession stand type foods. All spectators are allowed to park in the parking lots surrounding the school and the grass parking lot off of Verde Street (this is the street on the visitor’s side [eastside] of the stadium). Please look for event parking signage. The WIAA is not responsible for vandalism or break-in to automobiles. Please leave no items of value in your car, i.e. wallets, purses, cameras,radios, etc. Tomorrow, 5/19, is Day 1 of the Super KingCo (aka District) meet. Athletes that qualified for Districts (you know who you are), the bus leaves the school at 12:45 p.m.
Xtra xtra read all about it. Find out who is running in what event on Wednesday and Friday at KingCo. Both are also located at “Schedule” in the main menu. Here are the entries for JV KingCo this Thursday. Please speak to one of the coaches if you would like to change events. Remember there is no early dismissal for this meet. We will leave IHS from the back parking lot at 2:30. Wednesday – Varsity KingCo participants only. Early dismissal 1:45. The bus will depart from the back of the school at 2pm. If you are not competing in varsity KingCo, you do not have practice. KingCo meet schedule (also located at “schedule” in the main menu). Thursday – JV KingCo at Newport HS. Regular meet schedule, with a start time of 4pm. The bus will depart from the back of the school at 2:30pm. All kids that do not compete in Varsity KingCo are expected to participate in this meet. There are no meets or practices for this group after today. Friday – Varsity KingCo participants only. 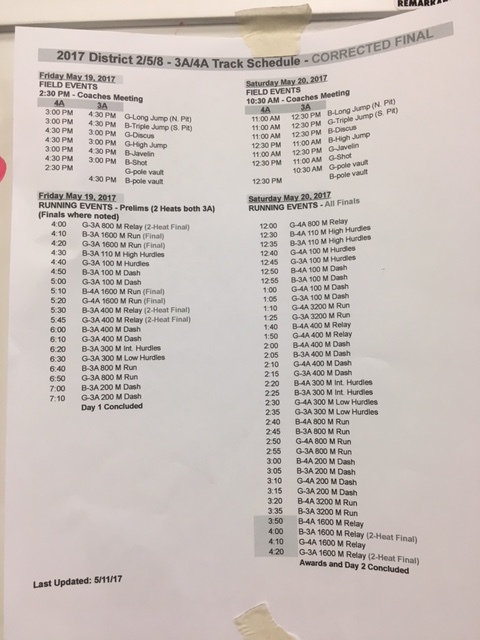 KingCo meet schedule. Dismissal is TBD. Any questions about the above, please speak to one of the coaches.